Sometimes it is stated that Lord Caitanya’s pastimes are still going on today and that we ourselves are part of these pastimes. Well I certainly felt like that during this (European) summer’s Ratha Yatras and other festival. In Berlin Bhakti Marg Swami made his intricate, professional, dancing movements and everyone tried to follow him with Sacinandana Swami enthusiastically taking the lead. Parama Gati Maharaja was running form left to right in front of Lord Jagannatha’s cart with an enormous smile beaming on his face the brahmacari were running after him. Maharaja was everywhere starting up a circle of dancing devotees holding hands, swinging around arm hooked in arm with Jayapataka Maharaja flying. The kirtana swept everyone up, we forgot ourselves. The onlookers on the sidewalk stared at us. Where in the world is there such a sight? Sacinandana Maharaja swirled and all the dancers jumped higher, the drums increased in crescendo, at one point everyone was as if electrified with the energy of the kirtana. Lord Jagannatha is amazing he eats fifty two times a day, there is no limit to how much service He can bring out of His devotee! Now the season is changing the summer is coming to an end Janmastami is approaching. 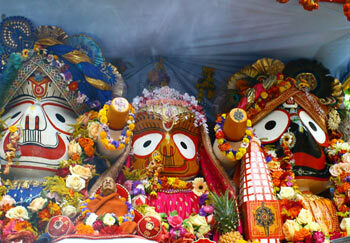 Soon we will go to Vrndavana for Kartika. Then for me the last two months of the year will be more introspective, rising early, chanting the Holy Name in the Holy Dhama, and meditating on the Caitanya Caritamrta. Today the journey goes on by train, plane, car from Germany to Spain for la Fiesta, the big Janmastami party. 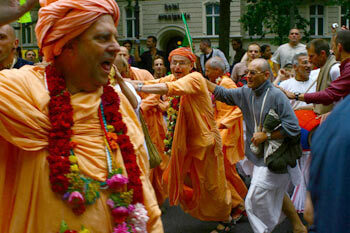 Then back to a German island with a few brahmacaris for some days, for peaceful japa, katha and meditation. In September will be again South Africa for a month, I am bound to go drawn by all the wonderful devotees. Thus I travel from one place to the next, places change, faces change, seasons change and mellows change and along we remain in the transcendental pastimes of Lord Caitanya’s movement which day by day touches more and more people around globe.